The 24-Hour Mommy: Foldabots Toy Book 4 Launching This Weekend! Foldabots Toy Book 4 Launching This Weekend! If you have a boy like me, K-Zone is probably in your monthly To-Buy list. Honestly, it's not only my boy who enjoys it but us adults as well. I especially love reading the Game Zone section because my boy and I also bond through video games. Rap, on the other hand, is engrossed in increasing his Foldabots collection. This is why he's super excited for Foldabots Toy Book 4!. 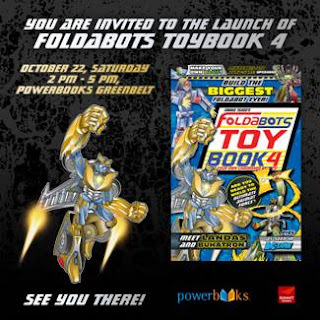 The good news is, the fourth installment of Jomike Tejido's Foldabots Toy Book is going to be launched this Saturday, October 22, 2011 from 2-5 p.m. at Powerbooks Greenbelt 3 in Makati. If you want to join the games and win prizes, you got to be at Powerbooks and register from 1 to 2 p.m.. I am definitely buying one for Rap and maybe a few more as Christmas gifts for my bigger inaanaks. I like it because it develops imagination and creativity in kids. Judging from the book cover, I'm sure the Foldabots inside this collection are worth buying. This toy will make my brother crazy, thanks for this post! wow! that is so nice! my youngest loves FOLDABOTS so much, but we only have the first edition, lol!